After two years of closely working together, Coca-Cola and Mercado McCann will honor the FIFA World Cup in Russia presenting one of the brand’s most meaningful advertising campaigns in 200 different countries. Mercado McCann was not only responsible for developing the Core Creative Idea (central idea) of the campaign: "being READY", three of the four TV commercials of this campaign designed for various formats were also developed by the agency: Stock Up, to the beat of “Are you ready”— an AC/DC classic inspiring football fans to purchase enough of their favorite Coca-Cola before each of the matches; Ready For, in which company employees talk to the bottles and prepare them for the emotions they may experience during the FIFA World Cup alongside the fans while inspiring them to “show the world what they’re made of”. It’s worth mentioning they will both feature world-renowned musical artist Jason Derulo, writer and performer of Coca-Cola’s anthem for the 2018 FIFA World Cup. The third ad, Uplifted Alex is the first to appear within the frame of the 2018 FIFA World Cup. There’s much more to it than just a commercial, it innovates in the field of brand advertising: Mercado McCann and Coca-Cola created the first spot within a videogame to be launched on real-world platforms. When playing EA Sport’s FIFA ’18 in Journey mode, Alex Hunter, star of the game, will sign a sponsorship contract with Coca-Cola becoming the brand’s first virtual ambassador. Players will be able to watch him shoot a commercial. Uplifted Alex came to life as an ad to launch the new Coca-Cola Zero Sugar being pre-released on the Coca-Cola Sign in Times Square – the first 3D electro-kinetic billboard. The commercial was later played in movie theaters and on social media platforms. The fourth spot, “Uplifters” was developed by The Cyranos // McCann from Barcelona. 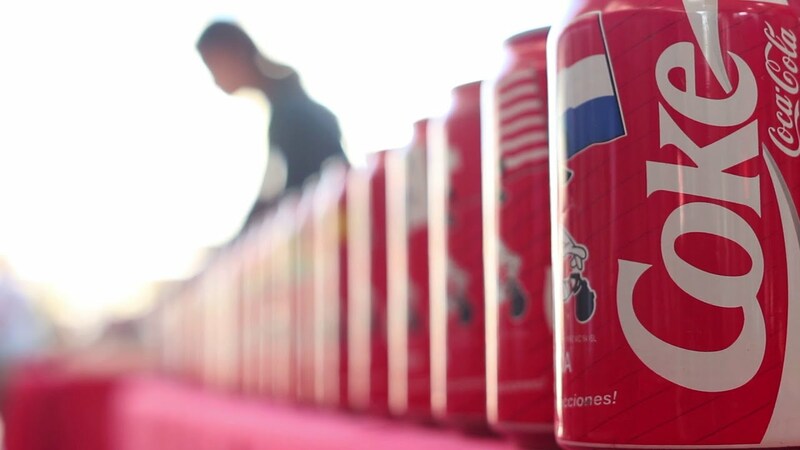 The campaign is complemented by a special edition of Coca-Cola cans with the numbers 0 through 9 printed on them. The idea behind Score Packaging is for fans to share predictions before each match with their friends on social media platforms. This global campaign led by Mercado McCann also included working together with Coca-Cola’s Global Design Team on the entire photographic campaign, carried out by photographers Guy Aroch & Anna Palma in New York City. The agency also participated on Panini’s digital sticker album with an exclusive section for fans, among other activation.